The family pet is an iconic part of the family unit, even if those pets aren’t of the traditional dog-and-cat variety. Pets are a great way to teach kids the importance of caring for another living thing, and give them a sense of responsibility. They’re also a lot of work, and their addition to the family is not a decision to be taken lightly. Before you bring your newest family member home, these are ten of the things that you should consider. What You Want Out of Pet Ownership – If you’re looking for companionship and a beloved family member, pet ownership might be the right route. If you’re just bending to kids demands in order to stop the pleas for a pet or you have the vague idea that you might like one, you may want to think twice about your decision to get a pet. Your Family Lifestyle – Families today are busy, between work, school and activities. Some types of pets, however, require plenty of socialization and care in order to thrive. If your house is usually empty and you’re determined to get a pet, you may want to consider more independent animals over dogs and cats that need affection. The Type of Pet Best Suited to Your Household – You may be harboring the lifelong dream of owning a Great Dane, but a cramped apartment simply isn’t going to accommodate a large animal. Think about what your property has to offer a pet and what drawbacks it presents, then choose your new family member accordingly. Shelters Versus Breeders – Some pet owners are insistent upon purchasing from breeders, while others feel that adopting from a shelter is the more ethical choice. Whichever option you choose, you’ll want to be well informed before making your decision. 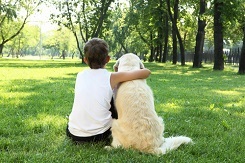 Kids’ Ages and Maturity Levels – Many parents purchase puppies or kittens when their children are small, assuming that they’ll “grow up together.” The truth is that an animal’s growth rate will quickly outstrip that of your child, and a very young child simply isn’t always capable of treating a pet as gently as the pet requires. Rough handling and clumsy treatment at the hands of a child may be unintentional, but it can make even the most well-mannered pet bite or scratch. Your Home’s Ability to Accommodate Pets – If you own a home with a reasonably large lawn and aren’t planning on moving any time soon, you may be ideally situated for pet adoption. Those that live in rental properties with harsh breed restrictions or no-pet policies will inevitably run into trouble when they’re ready to move somewhere less lenient, though. Thousands of pets end up in shelters and are ultimately euthanized because the families that took responsibility for their welfare surrendered them after moving to a new place where the animal wasn’t welcome. The Life Expectancy of Your Chosen Pet – Remember, you’re responsible for your pet for the rest of its life. You will also be responsible for explaining the life cycle to your children when a pet unexpectedly dies. Before bringing an animal into the family, consider its’ projected life expectancy. A turtle can live for decades, while a goldfish may be lucky to make it through the week in its new home. Financial Commitments – There’s more to pet expenses than just adoption fees and initial vaccinations. Your new family member will need to regularly visit the veterinarian, eat and have other supplies purchased for it. If money’s already tight in your household, a new pet may actually strain your budget more than you expect. Your Patience Level – Young pets will require patience during training, and older ones that you adopt will need a period of adjustment. Either way, you’ll have to be patient with your new pet as he gets used to these big changes in his life. Temperament and Kid Suitability – After the live action 101 Dalmatians film, animal shelters across the United States were flooded with Dalmatians. Parents rushed out to get these spotted cuties for their pleading children, only to realize that the temperamental and nervous nature of the breed is diametrically opposed to life with kids. Be sure that you have a reasonable idea of what your new pet’s temperament will be, and that you’re relatively sure he’ll be a good fit with your children after objectively appraising the situation.